Nosferatu (1922). 94 minutes. Directed by F. W. Murnau. Starring Max Schreck (as Count Orlok), Gustav von Wangenheim (as Thomas Hutter), Greta Schröder (as Ellen Hutter), Alexander Granach (as Knock), John Gottowt (as Professor Bulwer), and Georg H. Schnell (as Harding). Based on the novel Dracula by Bram Stoker. 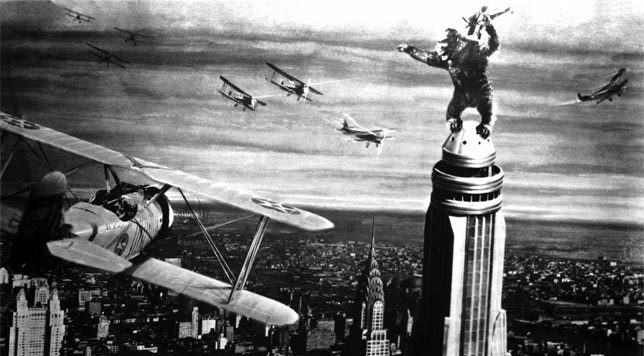 King Kong (1933). Directed by Merian C. Cooper and Ernest B. Schoedsack. Starring Fay Wray (as Ann Darrow), Robert Armstrong (as Carl Denham), and Bruce Cabot (as Jack Driscoll). Special effects by Willis O’Brien. Musical score by Max Steiner. King Kong is an adventure film about a director (Carl Denham) who enlists a down-and-out actress (Ann Darrow) to join a crew of men and sail to a mysterious island location, where he plans to make a film. He eventually tells his crew that the people who live on Skull Island, his destination, confine themselves to one part of the island, separated from the remaining territory by a large and ancient wall. It is not immediately clear what lives beyond the wall, but Denham plans to film it. We soon learn that the natives use the wall to enclose a monstrous, eighteen-foot-tall gorilla, whom they call Kong.